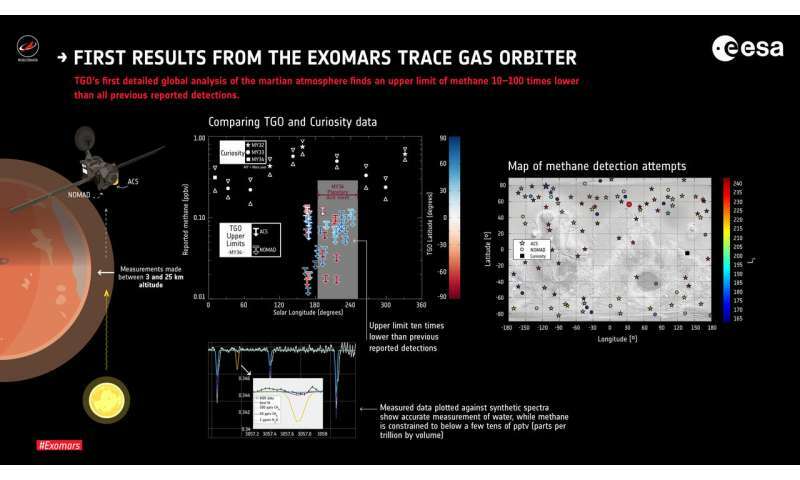 "We are delighted with the first results from the Trace Gas Orbiter," says Håkan Svedhem, ESA's TGO project scientist. "Our instruments are performing extremely well and even within the first few months of observation were already providing exquisite data to a much higher level than previously achieved." TGO's main science mission began at the end of April 2018, just a couple of months before the start of the global dust storm that would eventually lead to the demise of NASA's Opportunity rover after 15 years roving the Martian surface. This enabled the vertical distribution of water vapour and 'semi-heavy' water – with one hydrogen atom replaced by a deuterium atom, a form of hydrogen with an additional neutron – to be plotted from close to the Martian surface to above 80 km altitude. The new results track the influence of dust in the atmosphere on water, along with the escape of hydrogen atoms into space. 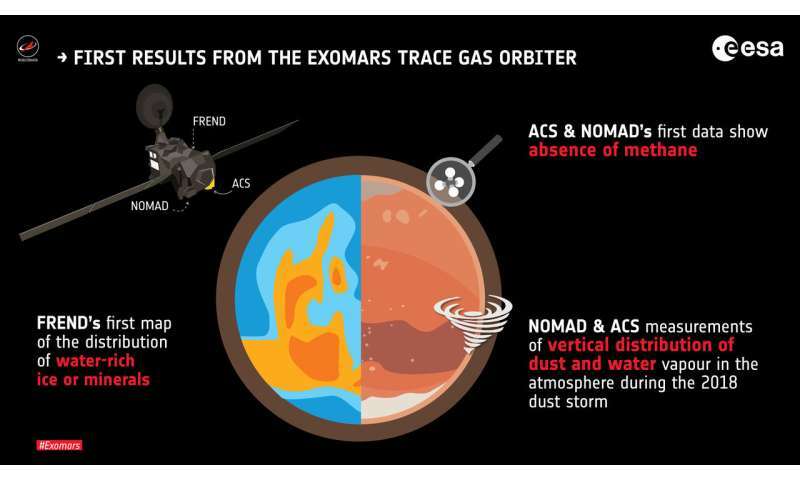 "In the northern latitudes we saw features such as dust clouds at altitudes of around 25–40 km that were not there before, and in southern latitudes we saw dust layers moving to higher altitudes," says Ann Carine Vandaele, principal investigator of the NOMAD instrument at the Royal Belgian Institute for Space Aeronomy. "The enhancement of water vapour in the atmosphere happened remarkably quickly, over just a few days during the onset of the storm, indicating a swift reaction of the atmosphere to the dust storm." The observations are consistent with global circulation models. Dust absorbs the Sun's radiation, heating the surrounding gas and causing it to expand, in turn redistributing other ingredients – like water – over a wider vertical range. A higher temperature contrast between equatorial and polar regions is also set up, strengthening atmospheric circulation. At the same time, thanks to the higher temperatures, fewer water-ice clouds form – normally they would confine water vapour to lower altitudes. "We see that water, deuterated or not, is very sensitive to the presence of ice clouds, preventing it from reaching atmospheric layers higher up. During the storm, water reached much higher altitudes," says Ann Carine. "This was theoretically predicted by models for a long time but this is the first time we have been able to observe it." Since the D/H ratio is predicted to change with the season and with latitude, TGO's continued regional and seasonal measurements are expected to provide further evidence of the processes at play. 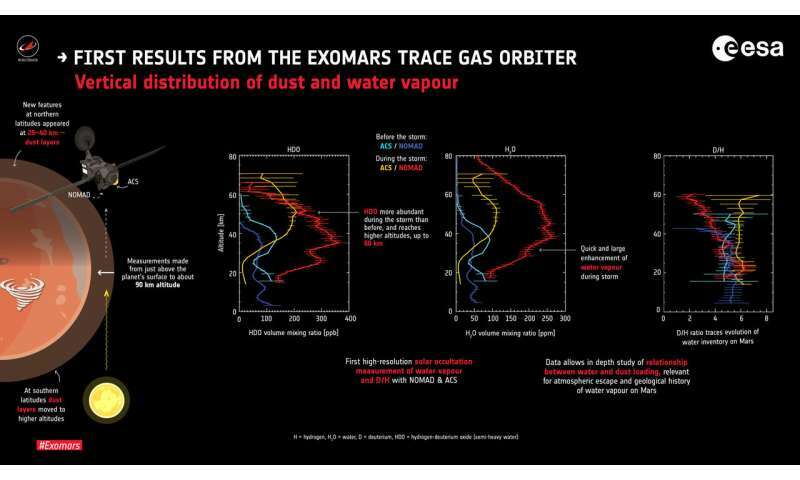 The two complementary instruments also started their measurements of trace gases in the Martian atmosphere. Trace gases occupy less than one percent of the atmosphere by volume, and require highly precise measurement techniques to determine their exact chemical fingerprints in the composition. The presence of trace gases is typically measured in 'parts per billion by volume' (ppbv), so for the example for Earth's methane inventory measuring 1800 ppbv, for every billion molecules, 1800 are methane. Methane is of particular interest for Mars scientists, because it can be a signature of life, as well as geological processes – on Earth, for example, 95% of methane in the atmosphere comes from biological processes. Because it can be destroyed by solar radiation on timescales of several hundred years, any detection of the molecule in present times implies it must have been released relatively recently – even if the methane itself was produced millions or billions of years ago and remained trapped in underground reservoirs until now. In addition, trace gases are mixed efficiently on a daily basis close to the planet's surface, with global wind circulation models dictating that methane would be mixed evenly around the planet within a few months. 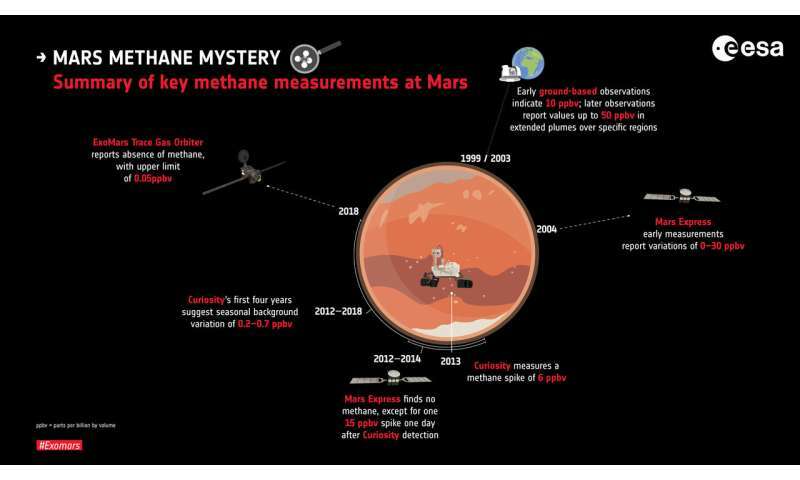 Reports of methane in the martian atmosphere have been intensely debated because detections have been very sporadic in time and location, and often fell at the limit of the instruments' detection limits. ESA's Mars Express contributed one of the first measurements from orbit in 2004, at that time indicating the presence of methane amounting to 10 ppbv. Earth-based telescopes have also reported both non-detections and transient measurements up to about 45 ppbv, while NASA's Curiosity rover, exploring Gale Crater since 2012, has suggested a background level of methane that varies with the seasons between about 0.2 and 0.7 ppbv – with some higher level spikes. More recently, Mars Express observed a methane spike one day after one of Curiosity's highest-level readings. "We have beautiful, high-accuracy data tracing signals of water within the range of where we would expect to see methane, but yet we can only report a modest upper limit that suggests a global absence of methane," says ACS principal investigator Oleg Korablev from the Space Research Institute, Russian Academy of Sciences, Moscow. "The TGO's high-precision measurements seem to be at odds with previous detections; to reconcile the various datasets and match the fast transition from previously reported plumes to the apparently very low background levels, we need to find a method that efficiently destroys methane close to the surface of the planet." "Just as the question of the presence of methane and where it might be coming from has caused so much debate, so the issue of where it is going, and how quickly it can disappear, is equally interesting," says Håkan. "We don't have all the pieces of the puzzle or see the full picture yet, but that is why we are there with TGO, making a detailed analysis of the atmosphere with the best instruments we have, to better understand how active this planet is – whether geologically or biologically." To help understand the location and history of water on Mars, TGO's neutron detector FREND is mapping the distribution of hydrogen in the uppermost metre of the planet's surface. Hydrogen indicates the presence of water, being one of the constituents of the water molecule; it can also indicate water absorbed into the surface, or minerals that were formed in the presence of water. The instrument's mapping task will take about one Mars year – almost two Earth years – to produce the best statistics to generate the highest quality map. But the first maps presented based on just a few month's data already exceed the resolution of previous measurements. "In just 131 days the instrument had already produced a map that has a higher resolution than that of the 16 years data from its predecessor onboard NASA's Mars Odyssey – and it is set to continue getting better," says Igor Mitrofanov, principal investigator of the FREND instrument at the Space Research Institute, Russian Academy of Sciences, Moscow. Aside from the obviously water-rich permafrost of the polar regions, the new map provides more refined details of localised 'wet' and 'dry' regions. It also highlights water-rich materials in equatorial regions that may signify the presence of water-rich permafrost in present times, or the former locations of the planet's poles in the past. 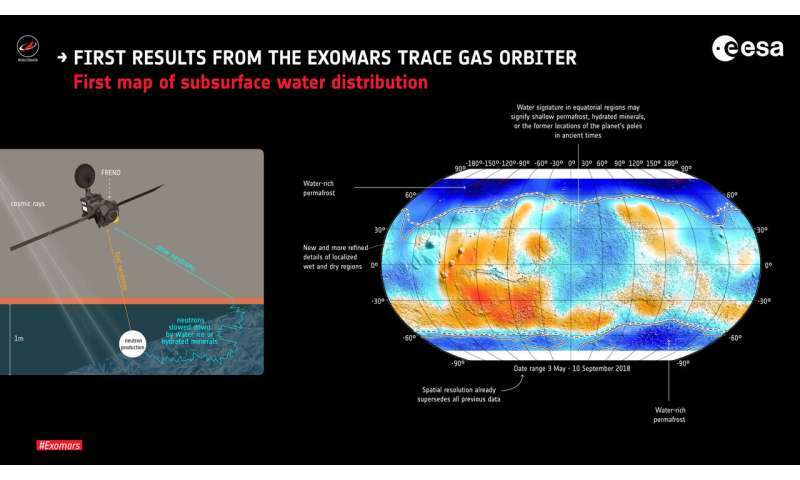 "The data is continually improving and we will eventually have what will become the reference data for mapping shallow subsurface water-rich materials on Mars, crucial for understanding the overall evolution of Mars and where all the present water is now," adds Igor. "It is important for the science on Mars, and it is also valuable for future Mars exploration." "We have already been enjoying beautiful images and stereo views of Mars thanks to the TGO's imaging system and now we are delighted to share the first look at data from the other instruments," concludes Håkan. "We have a promising future in contributing to the many fascinating aspects of Mars science, from the distribution of subsurface water, to active surface processes and to the mysteries of the martian atmosphere."